Islands of the mind. Not always safe places. Things that have happened have made landfall. Streams of things and islands were on Penny’s mind. Not just the Channel Island she was presently on but other islands that gave her a shut-in feeling. But Guernsey was very charming with its old buildings and sea views. It had a quaintness that was very different from England. It was a seascape in feeling. She was the one looking at the farms and Jersey cows that softened and supported the local economy. 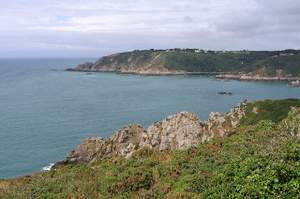 Guernsey was more laid back than Jersey, which had a more commercial, touristy feel. But she was thankful this holiday was nearly over and she could return to the bustle of the mainland and get these thoughts of islands out of her mind. The Jersey cows with their pretty cream softness unfortunately brought back memories of the farm she’d grown up on. This island with its quaint rural charm brought back the feeling of isolation she’d faced as a teenager wanting to know more of the real world. Often there had been only the cows to hug and talk to. Being again on a small island made her feel somewhat exposed, in a naked feeling kind of way. Like that day after her bath when she’d been dancing around in her petticoat watching for cars going by on the side road. Her mother had appeared at the door, her face red with anger. Her mother was probably only trying to protect her but the petticoat she was wearing was just like a dress. An under-dress costume with lots of tiny done-up buttons. But obviously such behaviour brought shame. Things about the adult world she didn’t yet understand. And as the last days of the holiday stretched like old elastic, Penny felt panic. Of being stuck somewhere lonely where there was nothing to do. On the farm the land had closed in when it rained so the front paddocks weren’t visible. She had time to watch rain drops coil and dance along the phone lines outside. Here the sea seemed to be threatening. Cold and flat like land because it was sheltered. A grey sea with no meaning or excitement. Oceans away from Pacific greenness. It was a haunting feeling that brought back memories of kicking to bits the ghosts’ heads of cabbage on the farm. Ghosts because they had been left too long. Not picked in time and white with age. But her imagination was having a field day and suddenly, at the Information Centre, she found a famous writer had been sent in exile from Paris here. He, too, had found the island lifestyle confining and barren in what it offered. After Paris. It had been a kind of imprisonment. He’d had too much to say about the new regime in Paris so he and his wife had had to leave. This was what was called the sleep of exiles. Of course the town was far too quiet, after what he was accustomed to, for him to find any enjoyment but, with his huge spirit, he continued to write daily. Finding out about this writer’s unhappy life gave Penny a much-needed focal point to block out those uncomfortable feelings when she had too much time on her hands. And although her knowledge of his work was limited, she knew he had been unhappy. He would, of course, miss the bars and cafes of Paris life and his friends so, for a little excitement, he turned to spiritualism, holding regular séances for his family and friends. They would listen for table tapping from ghosts like the Lady in White to relay their messages. Silence like a grey mist hovered over and around them as they sat at the table. But unfortunately, once invited, the ghosts didn’t wait for an invitation. Once asked in, they stayed, making the family uneasy. It all started to fall apart under the unwelcome intrusion. Some nights there were knocks on the wall. Other times, singing. Papers would stir as though moved by an invisible had. It got too much. The writer felt under threat from forces he had asked in when boredom struck. Ennui had to be better than this but negative emotions and energies had been aroused. The house was haunted. Excitement turned to unease. The family was now under strain. His wife left for Brussels. Alone, he continued to write and look for the universal like a truth. ‘Every bird that flies holds a thread of eternity in its claw’ was a line that Penny particularly liked. And the way, no matter what he was up against, he looked for beauty and the essence of things. And his sincerity was proved by his rules and actions. Snakes and toads freely infested his garden. Two live ducks his cook brought home for Sunday lunch were quickly released out into the garden. No flowers were to be picked for the house. Penny found the details of his life fascinating and began to identify with him and his views on life. She now felt she knew the man behind the famous writer. She liked his alternative universe. This was like a book coming alive with herself in the story, but she overlooked the themes of misery and unhappy endings. Discovering that the man had found an old sea port appealing, Penny wanted to go there. It had once been part of the French mainland and there was a ruined castle. In the end, he hadn’t moved there, preferring the company of friends in the town for support. Not sure of the location, Penny took the bus out to a far part of the island, forgetting this person liked closer areas to town. When she got there, there wasn’t any castle. There wasn’t anything but stark cliffs. But she’d got too involved in the details she’d found to be rational. This was not an old sea port – unless it lay far below on the sea edge. But this was taking her mind off grey thoughts into the magic of imagination. This windswept area was drawing her towards its edge. Cliffs chalky and slippery. A terrain she wasn’t used to. But she was used to high places and to getting down steep hills safely, the way cows do, because of living on the farm. Like the cattle, she turned her foot into the side of the tracks as they did, hoof by hoof. And this after all was a place of imagination that she wanted to wander through, so she carefully started down the sharp incline.The sandy beach and the sea lay below. But, looking for Victor Hugo, Penny fell down the cliff.